The Underwater Centre, a subsea training and trials center located in the Scottish Highlands, has turned a corner after receiving industry support to secure its future. Industry and public bodies including Oil & Gas UK, Subsea 7, TechnipFMC, Premier Oil and Highlands and Islands Enterprise (HIE) have collaborated to support The Underwater Centre and ensure that the industry continues to have access to critical, world-leading underwater training and can undertake vital subsea equipment trials. Senior representatives of Subsea 7, TechnipFMC and Premier Oil will join the board of The Underwater Centre. Oil & Gas UK, which supported the move, welcomed the collaboration effort supporting the continued delivery of specialist subsea training in the U.K. Commenting, Oil & Gas UK Chief Executive, Deirdre Michie, said, “I visited The Underwater Centre and I saw first-hand the value it adds to the U.K.’s world-leading subsea sector. As we continue to move out of the downturn and adapt to a changing future, it’s increasingly important that the U.K.’s offshore oil and gas industry works together to consolidate areas of strength. David McGhie, Managing Director of The Underwater Centre, welcomed the move, saying, “The center is of crucial importance to the North Sea industry as one of only two centers in Europe which provides closed bell diver training – a skill set which is vital to the North Sea sector. “We are delighted that the industry and Scottish Government have collaborated to ensure the future of the center. This genuinely positive collaboration will help to increase the value we can offer our customers and the entire industry in the future. Phil Simons, Senior Vice President Projects & Operations, Subsea 7, added, “This is a win:win for the Centre and the industry. Subsea companies like ourselves rely on the Centre to provide the highest standards of training and test facilities which are vital to safe and effective underwater operations in the oil and gas and other high-risk industries. Minister for Business, Innovation and Energy Paul Wheelhouse also welcomed the news: “I am delighted that The Underwater Centre has, with industry support, repositioned itself to achieve a long term sustainable future. Scotland is fortunate to have world class skills, and the infrastructure in place to ensure its place as a world-leader in diver training and as a trials facility. This is a good news story for the oil and gas sector as it continues to move out of the downturn, and demonstrates what can also be achieved through collaboration by industry. The Underwater Centre is a purpose-built subsea training and trials facility and is based on the shore of Loch Linnhe, sheltered by the surrounding mountains. 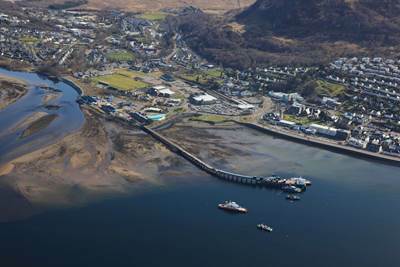 The center’s unique location allows it to provide year-round training and testing in an open-water environment, while still being centrally located in Fort William, the largest town in the Scottish Highlands.